Bob Bunge of Bowie is one of many amateur astronomers who chart the location and appearance of the Red Planet. At 2 o'clock on a recent morning, Bob Bunge ambled into the inky darkness of his Bowie back yard and prepared to meet an old friend. 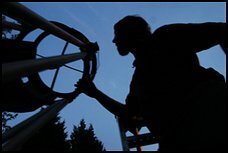 He swung the end of a massive home-built telescope skyward, gazed over the branches of a silver maple tree, then zeroed in on Earth's nearest neighbor. "Mars is as bright as I've seen it in my 23 years of amateur astronomy," he said, marveling at the detail he could spot on the Red Planet: the shimmering southern polar ice cap, and the alternating bands of darkness and lightness that gave Mars the mottled look of an overripe orange. It was a scene being played out wherever Earth was cloaked in night, as amateur astronomers enjoyed a celestial show not seen in recorded history. In the great race around the sun, Earth is gaining ground on Mars. The two planets line up on the same side of the sun roughly every two years, an arrangement known as opposition. This opposition, however, is particularly close. At 5:51 a.m. Wednesday, Mars will be 34,646,416 miles away from Earth, closer than it has been in nearly 60,000 years. To take advantage of the long-awaited proximity of the fourth planet from the sun, researchers have launched what NASA's top Mars scientist calls an "armada" of unmanned spacecraft. Some will scrutinize the planet from orbit. Others will drop rovers to scurry over the surface. Even so, hobbyists such as Bunge are doing much of the day-to-day -- or night-to-night -- Martian grunt work. Because the powerful telescopes that perch in thin mountaintop air or orbit Earth are usually trained on more esoteric targets than Mars, scientists depend on the work of amateurs. "We can't allocate time on valuable assets like Hubble to look at Mars every single available second," said James Garvin, NASA's lead scientist for Mars exploration. "They have too many other priorities." But barely an hour goes by when Mars isn't being observed by some earthling, who photographs it, sketches it or writes a detailed summary of its current condition. Mars is the only planet whose surface is visible from Earth, and amateurs such as Bunge can detect changes in clouds, polar ice and dust storms -- a volunteer sky-watching role akin to that played by amateur radio operators who tracked the path of the Soviet satellite Sputnik 1 in 1957. "We have no lives, we have good equipment and we have time," explained Donald C. Parker, a retired anesthesiologist from Coral Gables, Fla., and a member of the board of the Association of Lunar and Planetary Observers, a hobbyist group formed to supplement the work of professionals. Recent advances in telescope design, as well as the profusion of inexpensive Web cams and light-sensitive imaging instruments called charge-coupled devices, or CCDs, have allowed hobbyists to churn out pictures rivaling those produced by university astronomy departments 10 or 20 years ago. But many Mars observers use more old-fashioned tools: pencil and paper. Dave Klassen, an astronomer at New Jersey's Rowan University, studies Martian clouds. Klassen also oversees the Web site International MarsWatch (elvis.rowan.edu/marswatch), to which amateur observers from around the world upload views of Mars. "What's really nice is basically day to day I get an image of Mars that lets me see whether dust storms are kicking up, whether or not there are clouds," Klassen said. He takes those conditions into account when planning or carrying out research. The astronomer flew to Hawaii on Wednesday to look at Mars through the infrared telescope atop Mauna Kea. The amateurs' pictures, he said, "give me a nice way of putting my images in context. . . . By looking at the [MarsWatch] images a week before and a week after, it sort of provides context." NASA's Garvin lauds the network of skilled amateurs. "The same thing happens on Earth, where amateurs monitor local weather and stream quality," he said. "It's a great way of learning, educating and doing natural science. The fact that you can do it for a place like Mars is pretty cool." Bunge, a Webmaster for the National Weather Service, has been infatuated with Mars since he was a child in Columbus, Ohio. "I trace it back to my father, who regularly played Orson Welles's 'War of the Worlds' when I was young," he said. "Every Halloween, it was a family tradition to listen to it. When I got a telescope and got interested in observing, Mars was a natural target." On a recent morning, Bunge climbed the rungs of his custom-built three-legged ladder (made by a company that supplies orchards), a sheet of paper and a No. 2 pencil in hand. Mars was magnified 480 times, and through the eyepiece it looked about the size of a quarter. "The number one mistake beginning Mars observers make is to look at it and say, 'I don't see anything,' " said Bunge, 41. But be patient, he said, and details will start to emerge. The Association of Lunar and Planetary Observers has a detailed protocol for drawing Mars and even provides a 42mm-wide template. (Mars is 4,200 miles wide, creating a scale of 1mm to 100 miles.) The group urges observers to draw quickly, capturing the planet's essence in no more than 15 minutes. Any longer and Mars will have rotated enough to distort the drawing. So Bunge's hand moved swiftly. The first thing he drew was the planet's most obvious feature: the glimmering southern polar ice cap. Though it is at the bottom of the planet, he drew the crescent of frozen water and carbon dioxide at the top of the circle, perched on Mars like a tiny yarmulke. Because of the way a telescope inverts an image, south is up and north is down. "Then we'll shade a little bit here," he said as he added what are known as albedo markings, dark bands that gird Mars. "You can very easily be lulled into thinking they're continents or oceans," he said. Rather, they're due to the way light reflects off different types of Martian soil. To the untrained eye, the Mars portraits can appear underwhelming, resembling tendrils of bacteria crawling across a petri dish. But scientists value each seemingly inscrutable detail, and embellishment is strictly forbidden. "We discourage artists generally," said Parker. "They have a tendency to do art, which is nice, but it ain't real and it ain't science." "You draw what you see and what's real, and not something that's imagined," said Sam Whitby of Hopewell, south of Richmond. Whitby has been looking at the planet each night after his late shift as a mental health worker in a hospital. Mars has a tendency to inspire flights of fancy. Edgar Rice Burroughs and Ray Bradbury famously set civilizations there. Famed 19th-century Mars observer Percival Lowell thought he saw canals on Mars, proof of intelligent life. "His imagination got the better of him, and he saw a lot of things that weren't really there," said Whitby, 54. "You don't want to do that." Despite Mars's reputation as one of our solar system's most colorful planets, many artists prefer to work in black and white, because humans interpret the same color in different ways. Other Mars artists -- Miami's Carlos Hernandez, Italy's Mario Frassati -- produce ocher sketches that call to mind the pastel works of Marc Chagall. Rowan University's Klassen laments the growing dependence on space-based planetary observation. While admitting that orbiting satellites can produce stunning images of Martian craters and volcanoes, he says he thinks Mars study would be the poorer if people stopped looking at Mars from Earth. "It's a very different kind of viewing," he said. From Earth you can see the whole planet, not just the swaths of Marscape satellites provide. It's the difference, he said, between studying a forest in its entirety and studying it tree by tree. Before finishing his drawing, Bunge screwed a blue filter onto the telescope's eyepiece. This has the almost magical property of revealing any clouds that are lolling in the Martian atmosphere. There were none. "The forecast for Mars is clear and calm," Bunge said. And then he climbed back down to Earth.